Screenings are on Thursday, January 22, 2015 at 4 pm and 7pm. Location details: To get to the auditorium, take the elevator down one floor to the “Chamber” level. If you drive, there is underground parking garage at the Capitol, accessible off of Punchbowl Street via Miller Street. There are also outdoor metered stalls at ‘Iolani Palace, or along Punchbowl and Richards Streets. 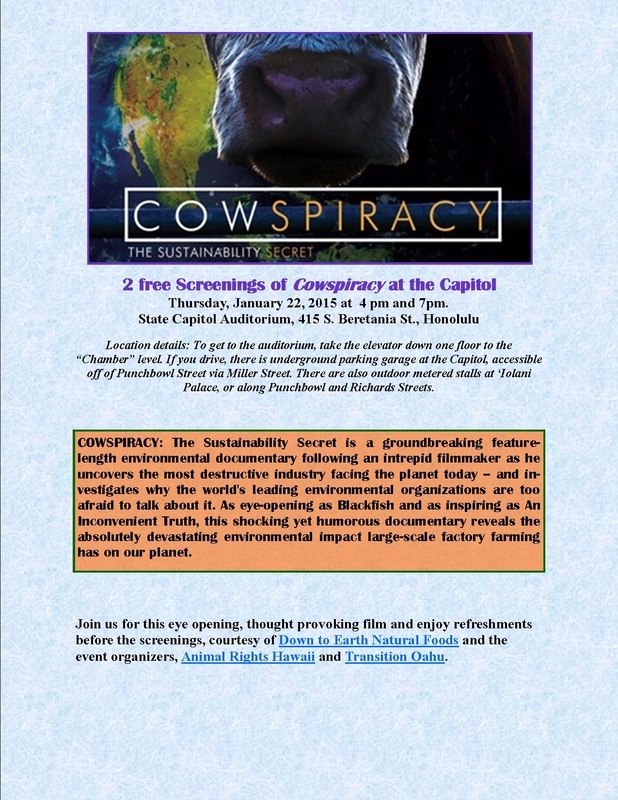 Join us for this eye opening, thought provoking film and enjoy refreshments before the screenings, courtesy of Down to Earth Natural Foods and the event organizers: Animal Rights Hawaii and Transition Oahu. Screenings are free, but registration is encouraged. Please click here to register. Thank you!